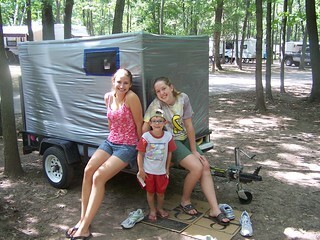 While looking at campers on YouTube, I found this Duct Tape Camper from a family in De Pere, Wisconsin. Here is a video of the camper construction. Using 7 rolls of duct tape, a utility trailer and some PVC pipe, they made a fun little trailer for the kids. The inside of the camper was sticky, so Randy (the girl in the video) and her friend decorated it with wrapping tissue. The trailer survived the drive to the campground 27 miles from their home, but they didn’t drive over 55 mph. Based on that camping trip, they believe the camper wouldn’t have survived highway speeds. After that one camping trip, they broke down the trailer to store for the winter and haven’t made another one since. When I was looking for a lightweight camper that I could make myself, I never thought of using duct tape. Even though it wasn’t quite what I was looking for, it’s an ingenious idea and a fun project for the family! Thanks for posting about our project. My daughter and I had a blast with it.